In 1973 Dr Richard Benton began a sociolinguistic survey of te reo Māori that led to turning point in the fate of the language. 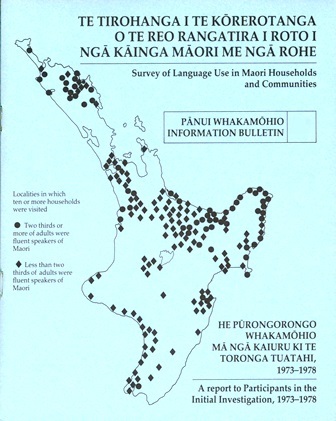 The survey was the first project undertaken by NZCER’s newly-established Māori Research Unit, Te Wāhanga Kaupapa Māori. The survey became known as the Benton report, and continues to be a reference point for sociolinguistic researchers. Under Dr Benton’s leadership, the new research unit focused on te reo Māori. He wanted to know the place of te reo Māori in schools and communities, and how the education system could ensure that it flourished. The survey was designed to answer two questions: who can speak Māori, and who does speak Māori? The survey gathered information from 33,338 individuals in 6,470 whānau throughout the North Island. The interviews were done kanohi-ki-te-kanohi (face-to-face) and with no dedicated funding, it was a lean operation. Over the six years of data gathering, more than 10 public and private sector organisations gave grants that enabled it to continue region by region. No funding was ever secured for the overview report, but the team honoured its commitment to report back to the communities and produced the 143 booklets that are now available online. The Waitangi Tribunal report led to the Māori Language Act 1987, and the establishment of Te Taura Whiri I te Reo Māori. In 2016 Te Taura Whiri I te Reo Māori commissioned Te Wāhanga to do research that would identify progress, barriers, and opportunities that bring about the regeneration of te reo Māori. That project revisited some of the communities that Dr Benton’s team had surveyed some 40 years before. Their reports, gathered as Te Ahu o te Reo, paint a more positive picture of the language.